University President Morton Schapiro. Schapiro discussed the $94 million budget deficit, CAPS funding and non-tenure-oriented faculty at a Wednesday Q&A. University President Morton Schapiro discussed the budget deficit and controversial visiting evolutionary psychologist Satoshi Kanazawa during a Wednesday question-and-answer session. 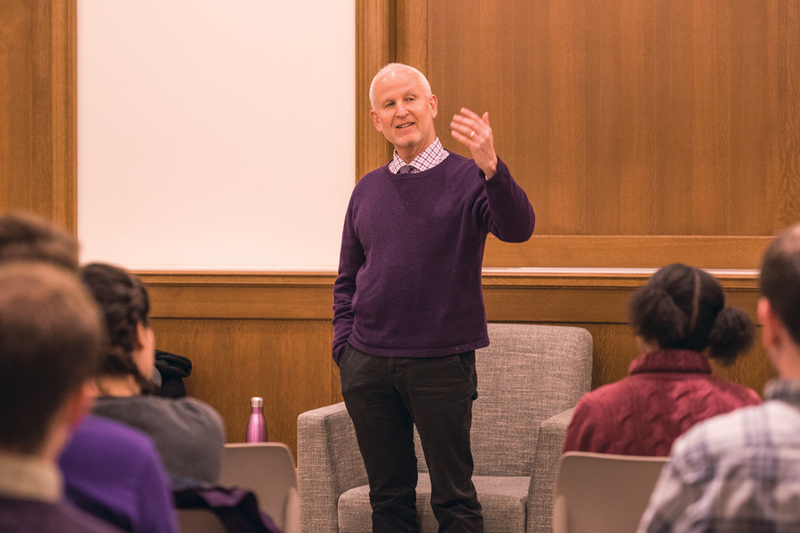 Schapiro’s “Southwest Neighborhood Q&A,” held in Willard Hall’s Great Room, drew a crowd of about 40 and gave students an opportunity to ask him questions about funding for mental health programs, non-tenure-track professors and the effects of the government shutdown. Schapiro said Board of Trustees members, tenured professors and students all have competing “agendas” concerning Kanazawa’s presence at Northwestern. The issue is further complicated by varying considerations around academic values, he added, but did not take a specific stance on it. Schapiro also addressed the $94 million budget deficit, which has led to cuts in student services as well as layoffs and the removal of funded positions. When asked specifically about funding for student services provided through the Division of Student Affairs, Schapiro said that students’ safety and wellness is his first priority and that he places “no constraint” on funding for the division. He acknowledged students criticizing the lack of funding and long wait times for Counseling and Psychological Services. Schapiro said he wanted to improve the conditions and pay of teaching professors, particularly for non-tenure-track faculty. He noted that hiring approaches can differ between departments and disciplines. Schapiro said the budget deficit is projected to end “within a year,” though Craig Johnson, the vice president for business and finance, told The Daily last week that the University would not move into a surplus until 2021. Once out of a deficit, Schapiro said his first priority is to improve conditions for non-tenure-oriented faculty. McCormick first-year Grace Wainaina said that the talk was remarkably “open” and that she was glad to hear that Schapiro was “genuinely” looking for ways to improve the school. As someone who “value(s) teachers,” she emphasized the importance of his comments on non-tenure-oriented professors. Weinberg junior Bernard Caillouet said that he had hoped to hear more about how Schapiro would improve the undergraduate experience both academically and with regards to support programs.